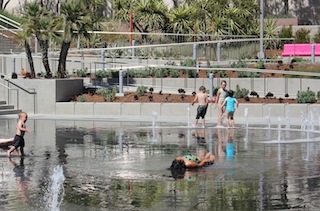 Splash pool and lawns in downtown L.A. The unveiling of two refurbished open spaces in downtown Los Angeles last month offered a glimpse of boosterism at its most canny. The message: Recession? What recession? LA’s blooming. Trendy loft dwellers, walk your dogs and, while you’re at it, whip out your smart phones and call your dog-owning suburban friends to come buy more lofts. Density is in, the hissing of suburban lawns is out. 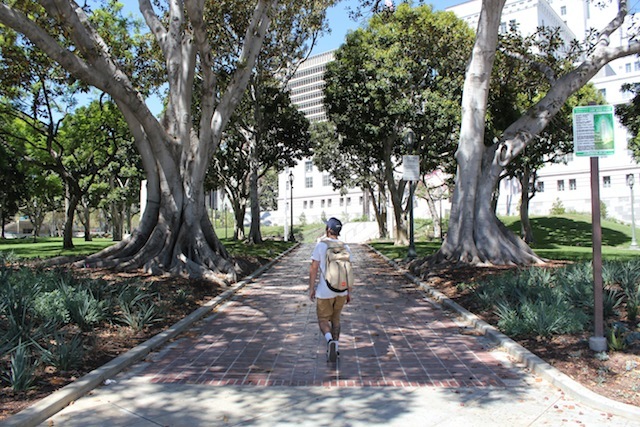 Given how hard it is to get any outdoor space committed to public use in Los Angeles, the places formerly known as Civic Center Mall and the City Hall south lawn deserve respect. But are their buffed up versions any good? If so, are they as good as they should be? What is their conservation profile? The people hyping them call both places “parks.” Are they? What’s with the streets running through one? The definition of park is a moving target. To an inner city kid, it can be as little as a vacant lot with space to chase a lizard or kick a football. In New York, it can be the opportunity to plant an abandoned highway. A prominent Los Angeles non-profit wants the derelict alleys bisecting old and largely poor neighborhoods to be parks. To judge by news reports, (1, 2) as Mayor Antonio Villaraigosa scrambles to cement his shaky green legacy, the City of Los Angeles considers itself to have begat a park by tearing down blighted homes, paving the footprint, slapping in swingsets and handing officers of local block clubs the keys. In 1928, when City Hall was finished, it would have been pushing credulity to describe the land around the newly built tower as a park. It’s scarcely big enough to throw a ball for a dog unless you want the dog to be run over in the tight quadrant formed by the building, Main, 1st and Spring streets. Rather, City Hall’s southerly setback from 1st Street looks like it was intended as a dust ruffle for the vaulting white landmark, with a small gathering space for civic events. Post-Occupy, its value for political gathering has been constrained. The formerly open perimeter of the garden is still rimmed by the construction crew’s chain link and the park has opening hours. So is Grand Park a park, or a commercial update of a relic of the Cuban missile crisis? 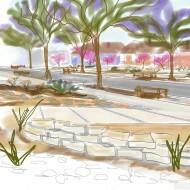 Grand Park schematic design. Source: LA County. Click on the image to enlarge. Both, arguably. When the above-ground portions of the buried garages between Spring Street and Grand Avenue opened in 1966, they were (and still are) intersected by the major downtown thoroughfares of Hill Street and Broadway. Even the most exaggeration-prone promoters referred to the planted garage roof as “park-like.” Rather, the space was named the “Civic Center Mall,” with a second, soon forgotten name of “El Paseo de Pobladores” tagged on. Over time, the trees in the mall honoring LA’s earliest Mexican settlers grew to the point that by the 1990s, their limbs did provide a valuable downtown maze of shade, much of which the new Grand Park ripped out in favor of great swathes of flat, heat-soaked lawn. 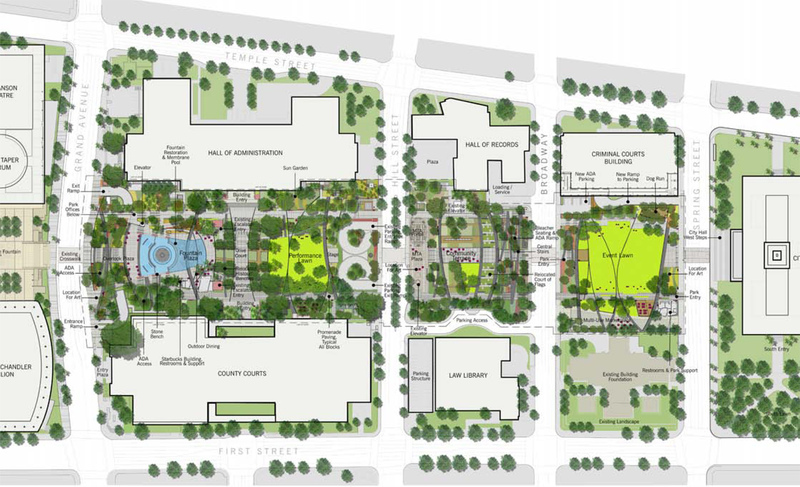 So, in one of many ironies, the baby boomer era-mall was more park-like and the brand new Grand Park is more mall-like. 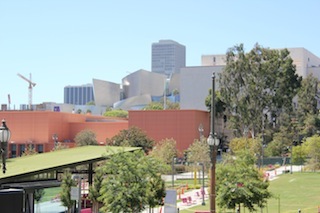 Buried in shallow wells is an important criterion about most downtown parks, from the ribbon of trees behind Disney Hall, to Grand Park to the Cathedral of Our Lady of the Angels. The gardens are almost all planted in captured space above garages. Their trees are, in effect, potted plants with their sell-by date determined either by how well the trees handle abuse, or how the roof holding them up fares under their weight and water. So it could be that the generous shade trees of the 46-year-old El Paseo de Pobladores were ripped out for structural reasons, though they arguably could have been put back, and the mall restored instead of razed. But it seems just as likely that the intent behind the tree clearing was clear long views, to create sweeping vistas of the handiwork of Bunker Hill’s potentates. One must never discount the ego of the Eli Broad and his ilk. How the new open vista of “Grand Park” must make the breasts of city hall politicians, project donors and architects swell. The sight-lines from City Hall steps has been opened up to reveal the steel and concrete plumage of Bunker Hill, from Disney Hall to the the Cathedral of Our Lady of the Angeles. The view southeast from Grand to City Hall is thrilling, but was it worth the lost shade? New trees will grow. So will new egotists. The banner thanking the country’s largest wholesalers and retailers of lawn, lawn pesticides and lawn grooming equipment hangs prominently displayed facing 1st Street from the LA City Hall fence. 8/26/2012 Photo: Emily Green. It’s hard to forgive the acres of turf in both new parks. Here you go, Pobladores. Sorry about dropping the name of the park. Now mow this. 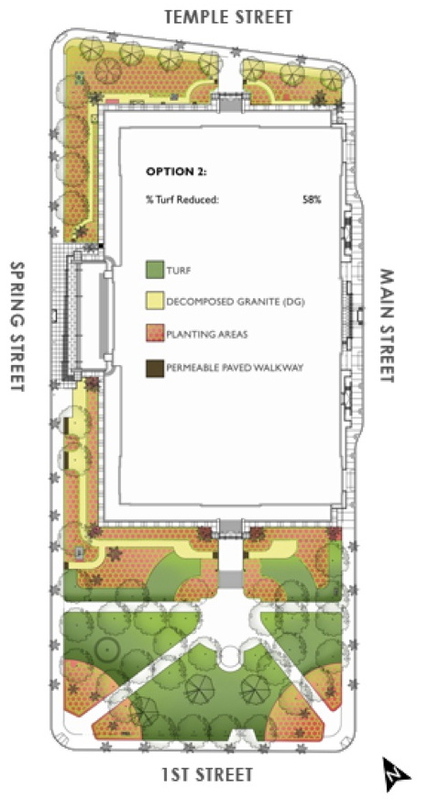 Surely each square foot of lawn here will get more use than suburban turf, but, even so, should it get the environmental equivalent of diplomatic immunity because it encourages planning density? Over at City Hall, under pressure from environmentalists, Rec & Parks landscape architect Tom Gibson deserves credit for removing more than 50% of the lawn in the post-Occupy makeover that led to this July’s big reveal. Yet, when the new south “park” was unveiled at City Hall last month, one of the most active campaigners for City Hall to build a conservation model sighed, “All I see as lawn.” The messaging is so bad, it’s tragic. 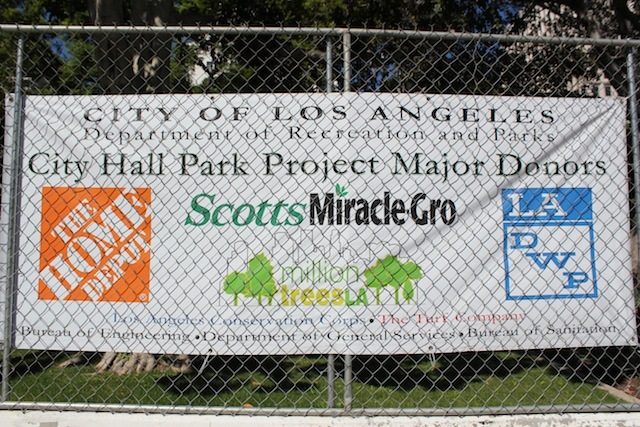 Give the PR men from Scotts-Miracle Gro Co a raise for donating to the project, for which they are prominently thanked in a sign outside City Hall. LA City Hall Park schematic design. Source: LA Department of Recreation and Parks. Click on the image to enlarge. It may be overstating their virtues to call the City Hall and Civic Center open spaces “parks,” but is it fun to visit them? Even only one third open, the northern tier of Grand Park is a blast. Given the presence of the 1966 fountain by the Burbank engineer J.S. Hamel, this always was the best part of the mall. But the new addition of a splash pad is inspired. Habitues of Broadway shops — a long-time Latino hotspot — have already found the new wading pool in force and last weekend were dripping with enthusiasm. Water art lovers will know that Hamel also designed the Astral Fountain for the 1964 New York World’s Fair and the fountain at Lincoln’s Center. High five to Grand Park planners for the public drinking fountain across from Starbucks. Five demerits for giving Starbucks the exclusive perch around the splash pool when its former situation was less predatory. On to the living elements. The plants are not well established. Shade is at a minimum. How designers and sunscreen companies love palms. Right now the whole feels like it was inspired by the foundation planting around Burbank Ikea. 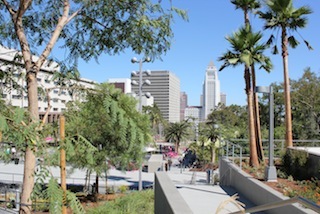 Neither Grand Park nor City Hall Park has much by way of native flora apart from some rye, native lilac and barberry around the edges, along with some heat-struck sycamores. While drought tolerant and a common Mediterranean climate style mix, Grand Park’s border plantings of olives, Jerusalem sage and French lavender could have been grabbed off the shelves by an HGTV team. It’s as sophisticated as a box of crayons. Where’s the romance? 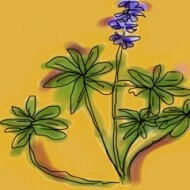 One day, some day, a big time designer will reveal a native garden blowsy with irises, coral bells and spilling over with toyon, coffeeberry, fremontedendron and mahonia and everyone will exclaim, By God Miss Jones, You’re Beautiful! 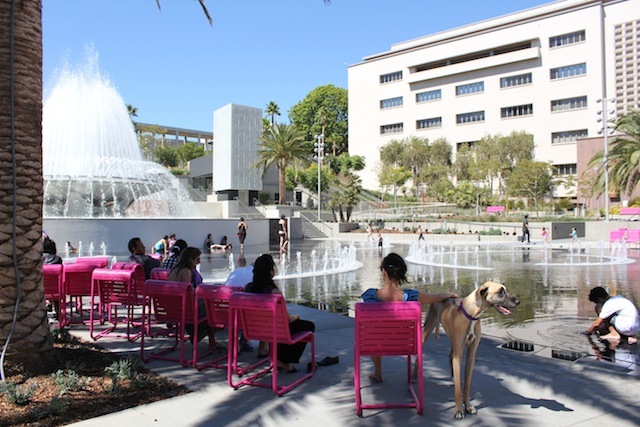 Over the years, Grand Avenue and Grand Park landscape architects have argued that downtown park planting should be as cosmopolitan as LA itself. This would bear scrutiny if our fauna and water supply were also equally cosmopolitan, but they’re not. Back to the central question: If a park can be run like a Scotts-Miracle Gro ad in a state where the water demand of turf is sucking the life out of its watersheds, then yes, these are parks. If your goal is to juice up downtown Los Angeles and promote density, and the latter is indisputably an environmental win, then they’re not only parks, they’re “grand” parks. The politicians earned their photo ops. Finally, if you’re a hot, bored kid given an hour in the splash pool after tagging along for a day of shopping on Broadway, you’re unlikely to care. It just feels great. There is no french lavender in grand park, just spanish lavender — and it stinks. Interesting write up. It’s sad that there isn’t more shade. also, the highline park in NYC was an elevated freight rail line, not a highway.